We live in times of increasing public distrust of the main institutions of modern society. Experts, including scientists, are suspected of working to hidden agendas or serving vested interests. The solution is usually seen as more public scrutiny and more control by democratic institutions – experts must be subservient to social and political life. In this book, Harry Collins and Robert Evans take a radically different view. They argue that, rather than democracies needing to be protected from science, democratic societies need to learn how to value science in this new age of uncertainty. By emphasizing that science is a moral enterprise, guided by values that should matter to all, they show how science can support democracy without destroying it and propose a new institution – The Owls – that can mediate between science and society and improve technological decision-making for the benefit of all. "Scientific and technological advances have a huge impact on our lives, yet science and society have an ambivalent relationship: science needs democracy to flourish but its techniques are beyond political accountability. 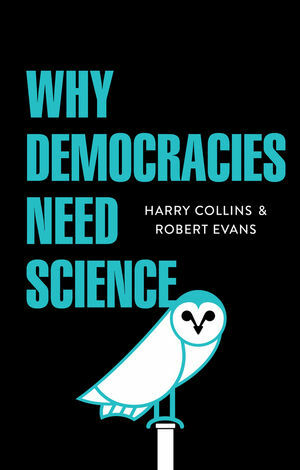 In this thought-provoking book, Collins and Evans assert that "science gives substance to the way of being of democracy". Consequently, science is a key to achieving and safeguarding our democratic ideals." "Free-market ideology threatens both science and democracy. Collins and Evans respond not with philosophical arguments but an appeal to common sense. They ask us first to see that we face a basic moral choice, and then to choose the values of modern science. A provocative and thoughtful book." "Should we only give credence to an expert in any given field, thereby discounting the view of non-specialists? Doing so would seem rather undemocratic. It would also appear to reduce the scope for holding experts accountable. [... Collins and Evans'] theory not only tries to explain how knowledge is acquired but also legitimises the contribution which non-practitioners can make to scientific practice."